Anger 0 Edition "This landmark book" (San Francisco Chronicle) dispels the common myths about the causes and uses of anger -- for example, that expressing anger is always good for you, that suppressing anger is always unhealthy, or that women have special "anger problems" that men do not. 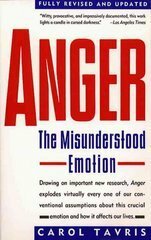 Dr. Carol Tavris expertly examines every facet of that fascinating emotion -- from genetics to stress to the rage for justice.Fully revised and updated, Anger: The Misunderstood Emotion now includes:* A new consideration of biological politics: Should testosterone or PMS excuse rotten tempers or aggressive actions? * The five conditions under which anger is likely to be effective -- and when it's not. * Strategies for solving specific anger problems -- chronic anger, dealing with difficult people, repeated family battles, anger after divorce or victimization, and aggressive children.